To ensure that such steam boiler systems are well maintained and operate at optimum efficiency it is essential that the correct water conditions are maintained at all times. Condensate corrosion control; The protection of steam boiler condensate lines is an important issue affecting the operation and maintenance of industrial boiler systems and steam raising plant. To ensure that such steam boiler systems are well maintained and operate at optimum efficiency it is essential that the correct water conditions are maintained at all times. This can be achieved using carefully selected chemicals for the protection of condensate lines in steam boilers. Accepta’s advanced technology steam volatile condensate line treatment chemicals have been scientifically formulated to protect condensate pipe work in steam boiler systems from the detrimental effects of acidic and oxygen corrosion caused by the steam condensate. 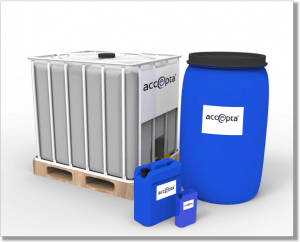 Accepta’s range of high performance condensate line treatments includes non-food, low toxicity and food grade (FDA approved) chemicals. Where a Condensate Return System is installed your boiler water treatment regimen will need to include preventative measures to protect the condensate line from corrosion. The two main causes of condensate line corrosion are Carbon Dioxide Attack which results in the uniform loss of metal below the water line and Oxygen Attack which results in local pitting. Both of these corrosive attacks can be prevented by the removal of these gases through effective water treatment and mitigation of their effects through the use of Amines. Be aware, the lack of suitable treatment will cause damage and failure of plant equipment. Removing Oxygen from the boiler is done by two steps, firstly the hotwell feed water temperature should be kept above 80oC as this will remove the majority of oxygen dissolved in solution. The second step is to treat the water with an Oxygen Scavenger such as Tannin or Sulphite which will remove the remaining O2. Where oxygen removal is not possible the use of a Filming Amine will create a protective barrier against the metal within the condensate line preventing oxidation. Removing Carbon Dioxide is more difficult which is where the dosage of a steam volatile Amine is recommended, this can be by a Filming Amine which creates a thin film barrier on the surface of the metal or a blend of Neutralising Amines which raise the pH of the steam and react with the carbonic acid neutralising it through the generation of hydroxide ions.